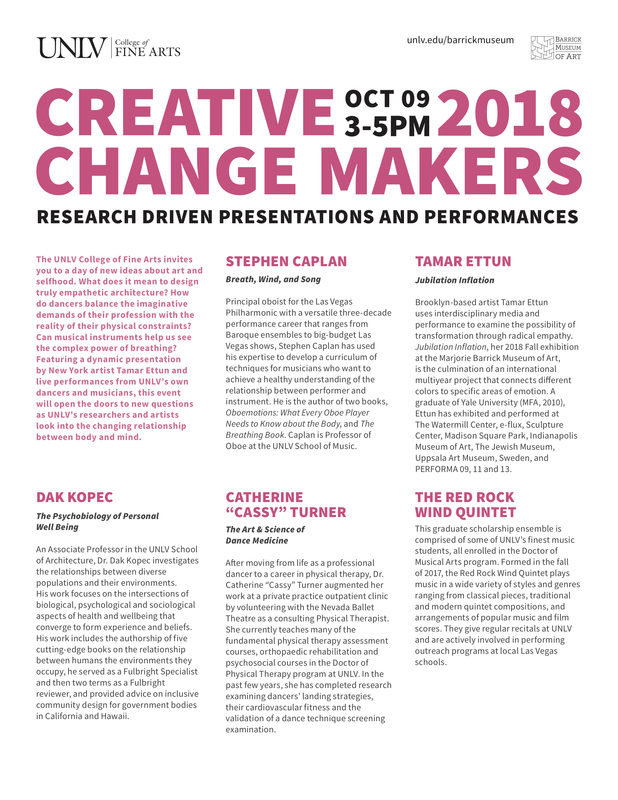 Creative Change Makers: Research Driven Presentations and Performances by the College of Fine Arts. Principal oboist for the Las Vegas Philharmonic with a versatile three-decade performance career that ranges from Baroque ensembles to big-budget Las Vegas shows, Stephen Caplan has used his expertise to develop a curriculum of techniques for musicians who want to achieve a healthy understanding of the relationship between performer and instrument. The UNLV College of Fine Arts invites you to a day of new ideas about art and selfhood. What does it mean to design truly empathetic architecture? How do dancers balance the imaginative demands of their profession with the reality of their physical constraints? Can musical instruments help us see the complex power of breathing? 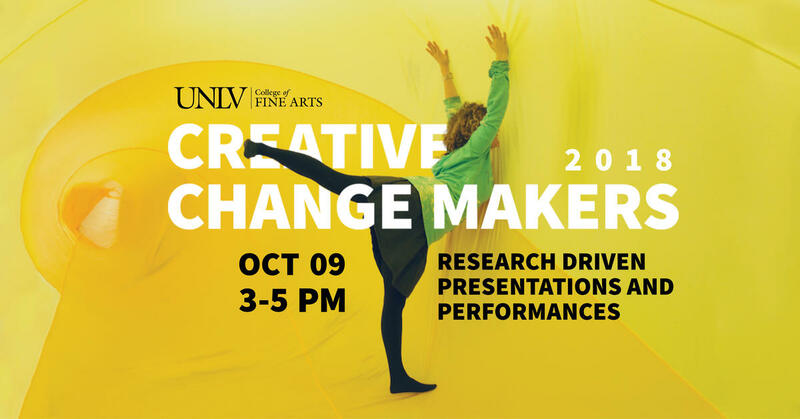 Featuring a dynamic installation by New York artist Tamar Ettun and live performances and presentations from UNLV’s own dancers, musicians, and architects, this event will open the doors to new questions as UNLV’s researchers and artists look into the changing relationship between body and mind. Principal oboist for the Las Vegas Philharmonic with a versatile three-decade performance career that ranges from Baroque ensembles to big-budget Las Vegas shows, Stephen Caplan has used his expertise to develop a curriculum of techniques for musicians who want to achieve a healthy understanding of the relationship between performer and instrument. He is the author of two books, Oboemotions: What Every Oboe Player Needs to Know about the Body, and The Breathing Book. Caplan is Professor of Oboe at the UNLV School of Music. Brooklyn-based artist Tamar Ettun uses interdisciplinary media and performance to examine the possibility of transformation through radical empathy. Jubilation Inflation, her 2018 Fall exhibition at the Marjorie Barrick Museum of Art, is the culmination of an international multiyear project that connects different colors to specific areas of emotion. A graduate of Yale University (MFA, 2010), Ettun has exhibited and performed at The Watermill Center, e-flux, Sculpture Center, Madison Square Park, Indianapolis Museum of Art, The Jewish Museum, Uppsala Art Museum, Sweden, and PERFORMA 09, 11 and 13. An Associate Professor in the UNLV School of Architecture, Dr. Dak Kopec investigates the relationships between diverse populations and their environments. His work focuses on the intersections of biological, psychological and sociological aspects of health and wellbeing that converge to form experience and beliefs. His work includes the authorship of five cutting-edge books on the relationship between humans and the environments they occupy, he served as a Fulbright Specialist and then two terms as a Fulbright reviewer, and provided advice on inclusive community design for government bodies in California and Hawaii. After moving from life as a professional dancer to a career in physical therapy, Dr. Catherine “Cassy” Turner augmented her work at a private practice outpatient clinic by volunteering with the Nevada Ballet Theatre as a consulting Physical Therapist. She currently teaches many of the fundamental physical therapy assessment courses, orthopaedic rehabilitation and psychosocial courses in the Doctor of Physical Therapy program at UNLV. In the past few years, she has completed research examining dancers’ landing strategies, their cardiovascular fitness and the validation of a dance technique screening examination. This graduate scholarship ensemble is comprised of some of UNLV's finest music students, all enrolled in the Doctor of Musical Arts program. Formed in the fall of 2017, the Red Rock Wind Quintet plays music in a wide variety of styles and genres ranging from classical pieces, traditional and modern quintet compositions, and arrangements of popular music and film scores. They give regular recitals at UNLV and are actively involved in performing outreach programs at local Las Vegas schools.